Grasshopper Manufacture and Digital Reality collaborate yet again with Black Knight Sword. Their last creation, Sine Mora, was a highly regarded entry in the shoot ’em up genre. This time around they deliver something completely different with an old-school style platformer that is overflowing with style. If you’ve played any of the recent games from Grasshopper Manufacture, such as Shadows of the Damned or Lollipop Chainsaw, then you know that Black Knight Sword is going to be something a little crazy. Right up front you will notice the game’s incredibly unique art style. 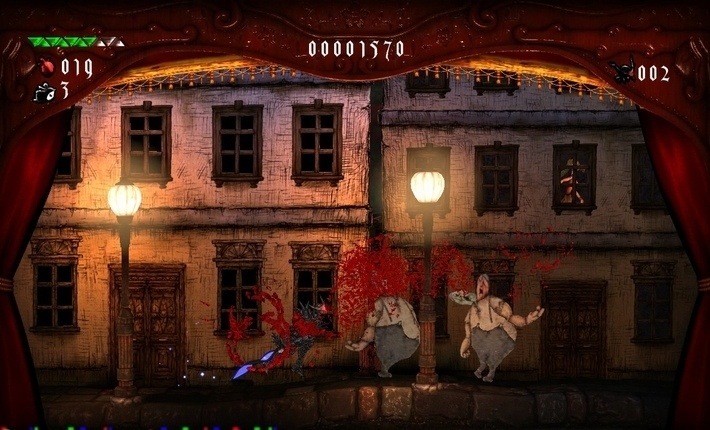 The game is presented as a theater show – there are always red curtains framing the action. This theater is made up from what appears to be paper cutouts with rigid movements. The actual design of the environments seems to draw inspiration directly from Monty Python, which is never a bad thing. The entire game is also accompanied by a narrator who just kills it with every line. He sounds like he came right out of the tour through Disney World’s Haunted Mansion and it is a perfect fit. The oddness of the game extends beyond just the presentation. You play the titular Black Knight, a being resurrected from a suicide victim. As the Black Knight you will aim to vanquish a variety of weird foes such as a giant chicken or a spider with a statue’s head for a torso. You will collect hearts from the enemies you slay to upgrade your abilities by exchanging them with what can best be described as a large eye…thing. This only touches the eccentric situations you will find yourself in. With the style of the game as unique as it gets, the gameplay ends up with the short end of the stick by being fairly traditional. You will be jumping around each of the game’s five levels vanquishing foes with short stabs of your sword. Levels are pretty long with each ending with some type of ultimate boss to face. Each of the levels feel distinct with the final two being especially memorable both for their interesting gameplay elements and visual flair. 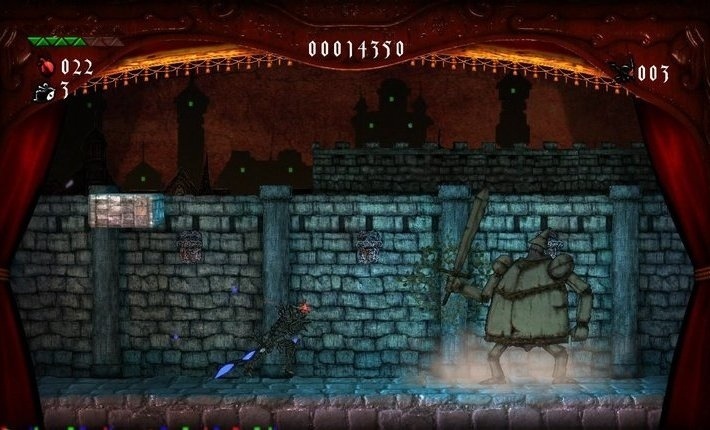 As far as gameplay, the only thing that Black Knight Sword does (notably) comes in the form of Black Hellbore, the creature that resurrected you as the Black Knight. 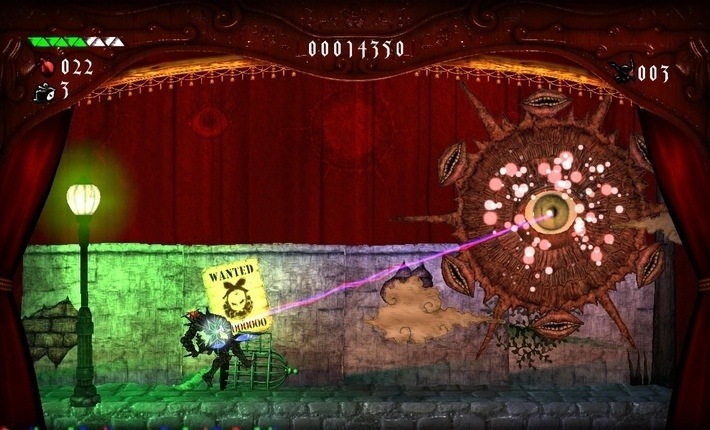 Black Hellbore serves multiple purposes: as your sword, your method of doing double jumps, casting spells and by being thrown out to attack enemies or activate switches. The catch is that if you throw out Hellbore, which you do often, you cannot use him for other things, most importantly double jumping and attacking with any strength beyond your puny fists. It’s a cool idea but the game never comes up with unique ways to use Hellbore’s talents until the final boss. The holdover that will turn most people off from Black Knight Sword is a brutal difficulty paired with a save system that can only be described as archaic. Expect to die often – there’s an achievement for dying 50 times – and when you do die enough times, prepare to be frustrated. Like games of yore, you have a limited amount of lives. You start with two although you can find or buy more in the store. If you use up all of your lives, the only recourse the game presents is to start the level over again, abandoning any progress you’ve made in the game up to that point, including any upgrades you’ve purchased. Levels can be as long as 45 minutes, so the prospect of playing through it again is almost inexcusable. Compound that with the fact that you will lose any upgrades you have been building up and you can see where the frustration comes in. The odd thing is that the game didn’t have to be this way. Levels are scattered with checkpoints throughout where you respawn when you die, however if you manually save after a checkpoint you can actually back out to the main menu and continue from that point as many times as you want. This loophole to work around the game’s terrible save system becomes necessary if you want to avoid replaying the same 25 minute section over and over again just to finish the level. Black Knight Sword is very easy to admire. The game is just overflowing with style and the zaniness of past Grasshopper Manufacture titles is in full effect here. It’s awesome in that respect. However the brutal difficulty, which is normally what is expected in these types of games, becomes much worse based off of how the save system works. If you are looking for a game that will test your old school gaming skills then Black Knight Sword is likely right up your alley. For the rest of us who have been coddled too much by the ease of today’s games, this one is definitely something to steer clear of. A review code for Black Knight Sword was provided to Pixel Related for review. Tags: Black Knight Sword, Digital Reality, Grasshopper Manufacture, Suda 51, XBLA. Bookmark the permalink.